He was the first person to scan, reconstruct and reimagine spiders’ weaved spatial habitats, and possesses the only three-dimensional spider web collection in existence. Saraceno lectures in institutions worldwide, and directed the Institute of Architecture-related Art (IAK) at Braunschweig University of Technology, Germany (2014–2016). He has held residencies at Centre National d’Études Spatiales (2014–2015), MIT Center for Art, Science & Technology (2012–ongoing) and Atelier Calder (2010), among others. In 2009, Saraceno attended the International Space Studies Program at NASA Ames. The same year he presented a major installation at the 53rd Venice Biennale, and was later awarded the prestigious Calder Prize. His work has been widely exhibited internationally in solo and group exhibitions such as Aerocene, at Solutions COP21, Grand Palais, Paris; Arachnid Orchestra. Jam Sessions, at NTU Centre for Contemporary Art Singapore; Becoming Aerosolar, at 21er Haus, Belvedere, Vienna (all 2015); In orbit, at Kunstsammlung Nordrhein- Westfalen K21, Düsseldorf (2013–ongoing); On the Roof: Cloud City, at The Metropolitan Museum of Art, New York (2012); Cloud Cities, at Hamburger Bahnhof, Berlin (2011–12), among others. Saraceno’s work is included in various collections, including The Museum of Modern Art, New York; SFMOMA, San Francisco; Walker Art Center, Minneapolis; Nationalgalerie, Staatliche Museen zu Berlin, Berlin. Saraceno lives and works in and beyond the planet Earth. After studying art and architecture in Buenos Aires, Frankfurt am Main, and Venice, Tomás Saraceno established his studio in Frankfurt am Main in 2005. The studio relocated to Berlin in 2012 and, after a brief interim, moved into the former administrative building of Actien-Gesellschaft für Anilin-Fabrication (AGFA) in Berlin-Rummelsburg. The studio gradually activated and renovated the previously unoccupied building, which was constructed in 1916, and the neighboring multi-story factory. Employees from multidisciplinary backgrounds, including designers, architects, anthropologists, biologists, engineers, art historians, curators, and musicians work in the hybrid environment of office, workshop, and the Arachnid Research Laboratory. The Arachnid Research Laboratory’s undertakings open up potential ways of reconnecting and recalibrating our attention and senses to our nonhuman kin, often unnoticed. Through expanding its networks of inquiry and collaboration, the Lab seeks to invent innovative, playful and engaging platforms for bringing research discourse into the public sphere. Over the past years, this has lead to an opening up of the research at Studio Tomás Saraceno into the fields of biomateriomics, bioacoustics, animal social behaviour and ethology, among others – via in-house research expertise and a close collaborative scientific network. These research inquiries become a way of engaging speculatively, but also sensitively, with the forms of life that exist all around us. In an era of ecological upheaval, there is a perceived imperative for anthropocentric worlds to re-attune to other species and more-than-human ways of inhabiting our shared planet. These artistic and scientific enquiries can enable new hybrid encounters and relationships, involving multiple entities: from spiders to humans, from gravitational waves to particles of dust. 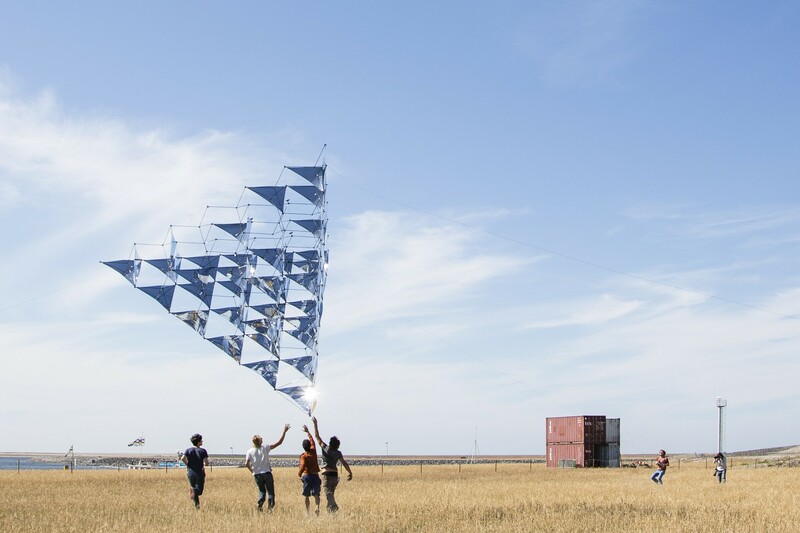 Studio Tomás Saraceno is comprised of Lars Behrendt, Fabiola Bierhoff, Francesca Boenzi, Saverio Cantoni, Claudia Melendez, Javier Rosenberg, Sonia d’Agrain, Duncan Anderson, Mateo Argerich, Manuela Azcona-Mazure, Scott Barnes, Prateek Bajpai, Ally Bisshop, Irina Bogdan, Sascha Boldt, Viola Cafuli, Viola Castellano, Yoonseo Cha, Tathiana Chaves, Connie Chester, Filippo Corato, Carola Dietrich, Joaquin Ezcurra, Gwilym Faulkner, Sara Ferrer, Chris Filippini, Luca Girardini, Canice Grant, Samantha Grob, Ricardo Gomes, Charles Gonzalez, Alice Hall, Martin Heller, Mariana de Heredia, Marina Höxter, Adam Hudec, Eric Jones, Jennifer Jordan, Katja Kaiser, Georgi Kazlachev, Elisa Kofol, Christos Kollias, Yelta Köm, Nemanja Kordic, Dario Lagana, Rosalie Laurin, Alice Lamperti, Steef van Lent, Camilla Lundell, Lisa Lurati, Tobias Lange, Rosalie Laurin, Davide Luciani, Lisa Lurati, Dominik Hildebrand, Vicente Macellari, Roxanne Mackie, Thomas McBride, Pepe Menéndez-Conde, Claudia Melendez, Jillian Meyer, Victoria Mohr, Olivia Moore, Roland Muehlethaler, Jörg Niemann, Lea Nikou, Jaime Norambuena, Aurelia Nowak, Aisha Pagnes, Joshua de Paiva, Tania Patritti, Martina Pelacchi, Marco Pittaluga, Manie Du Plessis, Brendan Power, Diego Puerto, Matthew Raven, Patrick Reddy, Antoine Renard, Michele Rinaldi, Raj Sandhu, Jazmin Scherone, Hans-Martin Schlesier, Aysegul Seyhan, Sebastian Steinboeck, Sven Steudte, Judith Strassenberger, James Sundermann, Anna Thor, Ilka Tödt, Hannah-Lee Turner, Deha Uzbas, Desirée Valdes, Violette Vanderlinden, Zaida Violan, Filippo Vogliazzo, Erik Vogler, Philip Weber, Flora Weil, Beatrice Zaidenberg, Davide Zucco. The copyright for published objects developed by Studio Tomás Saraceno GmbH itself remains only with Studio Tomás Saraceno GmbH. The copyright for any material published on this website is reserved. Any duplication or use of objects such as images, videos, sound files, diagrams and texts is not permitted without the written agreement of Studio Tomás Saraceno GmbH. All images courtesy the artist; Tanya Bonakdar Gallery, New York; Andersen’s Contemporary, Copenhagen; Pinksummer contemporary art, Genoa; Esther Schipper, Berlin; Ruth Benzacar, Buenos Aires, Argentina; unless otherwise stated. Studio Tomás Saraceno GmbH reserves the right to alter, supplement, or delete parts or the whole of the website’s content, or to temporarily or completely discontinue publication without further notice. Studio Tomás Saraceno GmbH has no influence whatsoever on content offered through direct or indirect links to other web providers and pages and does not endorse any of this content – with the exception of the content on social media profiles administered by Studio Tomás Saraceno GmbH. © 2018 Studio Tomás Saraceno. All rights reserved.